From My Front Porch: I asked for it! Fire pit weather - why didn't mother nature answer me when I asked for some rain for the crops the last 2 month's? Saturday we started our hunt for our new "show string" sporting shorts, flip flops and tank tops! On Monday when we went on another trek we were having to wear jeans, boots and sweatshirts, today's high was supposed to be 74 it got to a whooping 62 with a constant wind - so nothing sounded better tonight than chili! Which I made with some fresh tomato juice - I am not a canner (that is a whole other post) but the chili I made tonight with the fresh tomato juice might make me change my mind - might being the key word! it was a super easy, super fast recipe, really delicious and perfect with tonight's chili! cook them in the oven and serve them - very simple, very easy! So there you have it - we are 1 recipe closer to giving one lucky person a copy of Church Suppers! We love cornbread...especially sweet cornbread. With one cup of sugar in this recipe, I can only assume this was sweet! 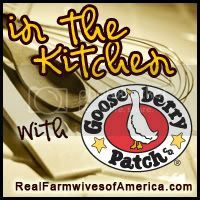 I love it when my blogging friends find a recipe I overlooked in the GP cookbooks! I've got the page tagged now! I'm with Tina, I love sweet corn bread and it does sound good with a bowl of chili about now. I like mine sweet too! Yummy! Sweet for me too! I like the idea of muffins instead of cutting into a pan of corn bread. I always get crumbs everywhere! I love corn muffins. Thanx for sharing.